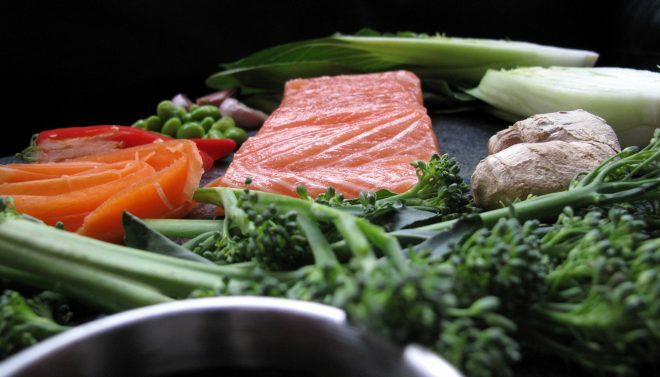 Most of us do not eat enough oily fish within our diet and often miss out on the healthful effects of the omega-3 fatty acids. 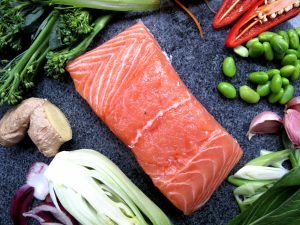 This Asian-style sweet and savoury salmon dish is a simple and tasty way to incorporate some fish into your weekly routine. The marinated fish can be served with a whole range of vegetables and accompanying side-dishes. For this recipe, I have chosen pak choi, a Chinese cabbage that can be found in most supermarkets. The pak choi works wonderfully alongside your favourite stir-fry vegetables, together with sesame seed topping and the sweet tasting teriyaki sauce. Super simple to make, I hope you enjoy it! Place a baking tray covered in grease proof paper into the oven and preheat to 200°C. For the marinade, finely chop the ginger and garlic and place into a deep bowl/dish (suitable to hold 4 salmon fillets). Add the maple syrup, soy sauce, rice wine and olive oil, and mix. Place the fillets into the bowl/dish ensuring that each fillet is well covered with the marinade. Cover with cling film and set aside in the fridge for ~2 hours, or at least 25 minutes. Place the marinated salmon into the oven (saving roughly half the remaining sauce) and bake for ~10 minutes or until the fillets have cooked through. Meanwhile, heat a large frying pan. Once heated, add the sesame oil followed by the onions, broccoli and carrots. Fry the veg until almost soft, pouring over 1-2 tbsp of the remaining teriyaki sauce. Remove from the frying pan and set aside. For the pak choi, cut a slice across the base so the leaves separate. Add the garlic and the pak choi to the pan and fry until the leaves start to wilt. Pour the stock over this and cover the pan, and allow to cook for ~5 minutes. It is best to cook the pak choi until tender but to still have a bit of a bite. Once the pak choi is cooked, divide into portions and serve on a plate. Add the stir-fried vegetables back to the pan and flash fry on a high heat for 1-2 minutes. Sprinkle the spring onions and red chillies to taste. Place the salmon fillets on top of the pak choi and pour the remaining sauce over them. Scatter with sesame seeds and serve with a side of the stir-fry vegetables. Serve as is, or with basmati rice or rice noodles. 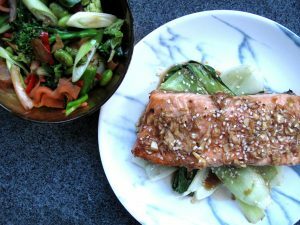 If you have enjoyed this Teriyaki Salmon and Pak Choi recipe, please feel free to share on Facebook or tag our Instagram page with your recipe-inspired picture.